StoneRidge Wholesale Division of Wautoma, Wis., is recalling approximately 656 pounds of fully cooked, not shelf stable ready to eat pork and beef bologna. The products contain sodium nitrite and sodium erythorbate, which are not declared on the label. 14-oz. 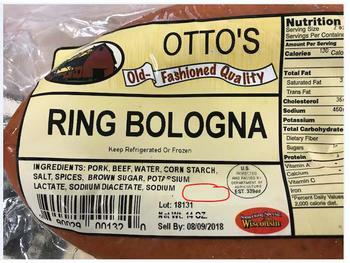 vacuum-sealed packages containing “OTTO’S Old-Fashioned Quality RING BOLOGNA” with a lot code of 18131 and a “Sell By: 08/09/2018” date. 14-oz. vacuum-sealed packages containing “OTTO’S Old-Fashioned Quality GARLIC RING BOLOGNA” with a lot code of 18131 and a “Sell By: 08/09/2018” date. The recalled products, bearing establishment number “EST. 33989” inside the USDA mark of inspection, were shipped to a retail location in Wisconsin. Customers who purchased the recalled products may return them to the place of purchase. Consumers with questions about the recall may contact Trevor Diedrick at (920) 787-5444.